Cape horses were extremely popular through the Boer Wars, but very little is known about the status of the Cape Horse breed today. 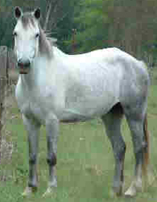 They originated in South Africa and greatly resembles Basuto Horses, however they are larger. Horses first arrived in South African when they were imported by the Dutch East India Trading Company in 1653. The first breeds were believed to be Barb and Arabian descendants shipped from the Island of Java, and they were the forefathers of both the Cape Horse and the Basuto. Gradually, the Cape Horse was refined by introducing Thoroughbred and Arabian blood. Through these crosses, the breed became larger and sportier than its Basuto brethren. Despite its huge popularity as a battle horse, the breed declined rapidly after the Boer Wars. The breed was also decimated by the introduction of low-quality Thoroughbred and crossbreed horses into the bloodline. Today, there is a movement to revive the Cape Horse as a regimented breed. They have a large head and a slender neck. Their hindquarters are muscular and their legs are strong. They are both fast and powerful. The bloodline has clearly been injected with Thoroughbred blood.